Hello and welcome to 2017! I hope you enjoyed Christmas and FINALLY seeing a new Doctor Who episode – The Return of Doctor Mysterio (2016)! I really liked it, it is one of my favourite Christmas specials ever. It felt really different and I was so pleased that Nardole was revealed as a new companion as I have wanted the Doctor to have another non-human companion for a very long time. I am looking forward to Series 10 and seeing how the Doctor, Nardole and Bill get along. Please leave a comment and tell me what you think about the Christmas special, I would love to hear what other people think. 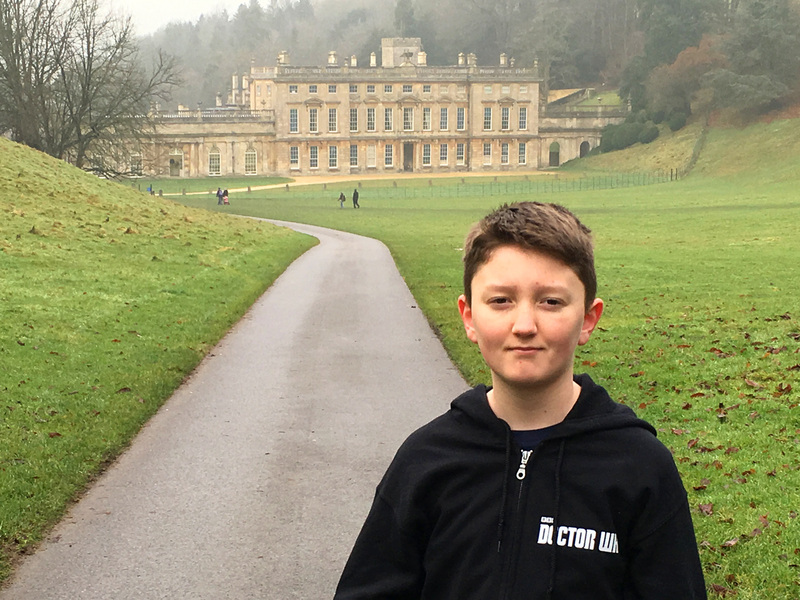 This time on Project Indigo we are visiting Dyrham Park in Gloucestershire, filming location for The Night Terrors (2011) which was an Eleventh Doctor episode. In this episode the Doctor, Amy and Rory visit a little boy in London who is so scared of his wardrobe that his fear is transmitted throughout the universe. This mission to help the child leads them to become trapped in a Dolls House where they must fight peg-dolls that would scare anyone silly! Dyrham Park is a National Trust property near Bath. This country house was built in the late 17th Century for a politician named William Blathwayt who received the land through marriage to Mary Wynter. He is very well known in America as he was a key figure in the administration of the American Colonies and he also served as Secretary of War under James II and William III. This house was chosen as the filming location as it looks like it would make a perfect Dolls House. I visited at Christmas time when the weather was grey but dry. First I explored the grounds which are famous for being home to a herd of fallow deer. 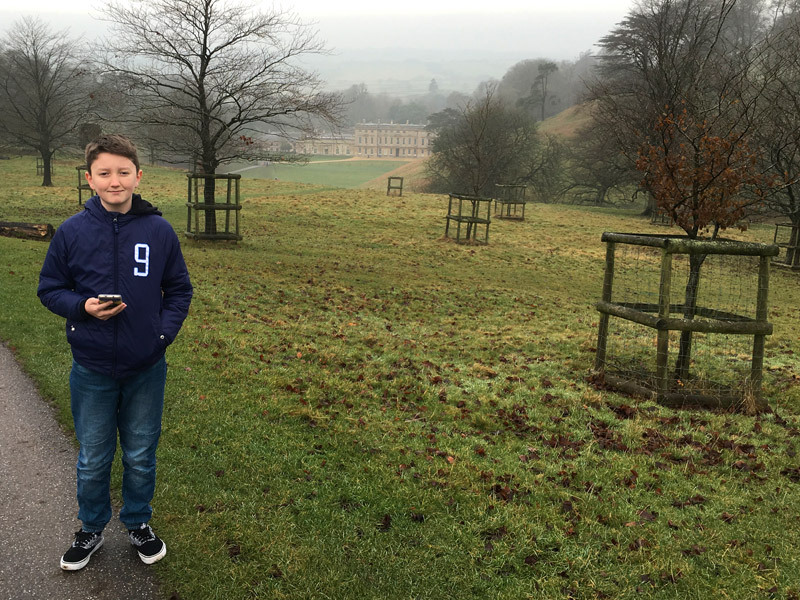 The name Dyrham comes the Anglo-Saxon word ‘dirham’ which means ‘enclosure for deer’. The deer park covers 270 acres! The gardens are in the middle of a project to recreate the look of the 17th Century. I found a gate which took me to the Lost Terraces which are still undergoing work to restore them. I walked in the footsteps of William Blathwayt which have just been uncovered and looked down upon St Peter’s Church where he got married. It felt very tranquil in the terraces and I saw a lot of wild-life including a friendly robin, squirrels and a bird of prey. Afterwards I went into the house which was very imposing. 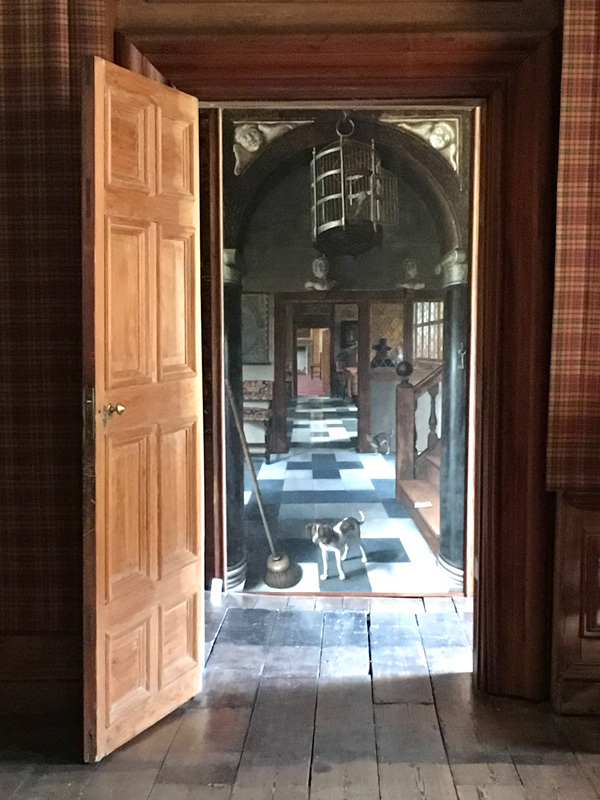 I recognised the wooden panelled walls from The Night Terrors but in the episode all the furniture had been removed for filming and replaced by Dolls House furniture, including a wooden frying pan. Luckily there were no peg-dolls there so I was not scared. Look out for Peg Dolls! Do you recognise the checked floor from the Dolls House? I could see lots of worldwide treasures from a time of exploration including Dutch items such as blue and white Delftware Pottery and a still-life by Cornelis De Heem. There was also a famous Trompe L’oeil by Samuel Van Hoogstraten, a picture which messes with your mind. Trompe L’oeil is French for ‘deceive the eye’ and creates a 3D illusion. In the 17th Century a painting like this was as new and exciting to people as a trailer for the new Nintendo Switch now! This is NOT a Trompe-L’oeil! On the way out I was offered some hot chocolate made using a 17th Century recipe. For me it felt more like a punishment than a treat – it was very, very spicy! 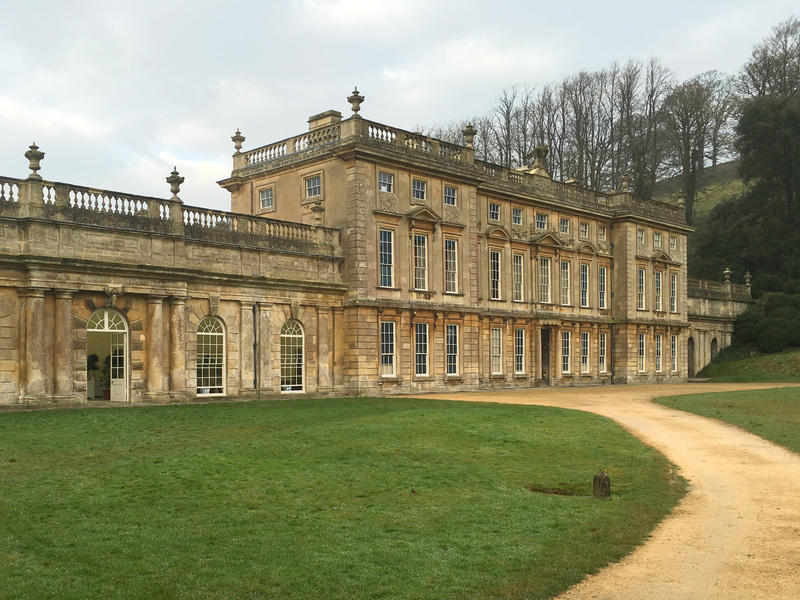 It is not just Doctor Who that has been filmed at Dyrham Park – in the New Year some of the new series of ‘Poldark’ was filmed there too! Other things filmed at Dyrham include the film The Remains of the Day (1993) and the original series of Poldark from the 1970s. A most excellent place to hunt Pokémon! 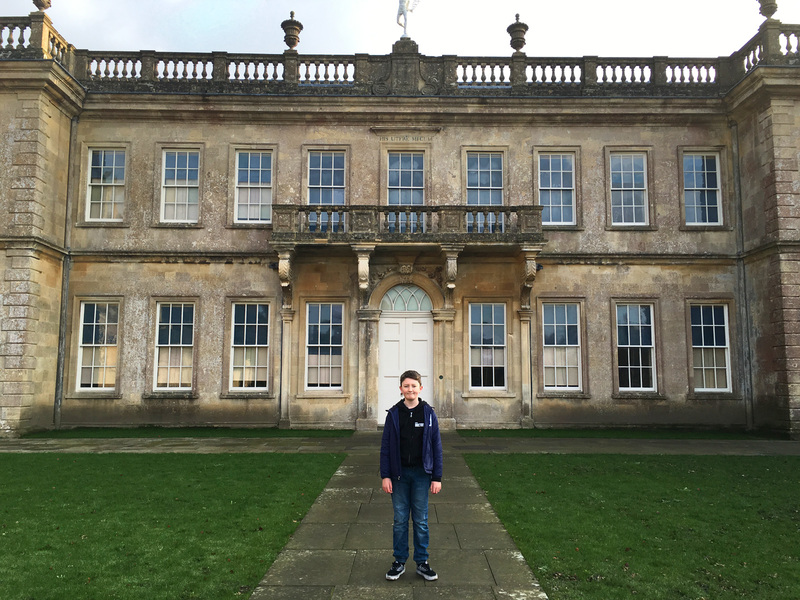 I had a fantastic day at Dyrham Park and I would recommend anybody to check it out – even better if you are a Pokemon Go player because it is chock full Omanytes and lots of long walks to help hatch your eggs. 🙂 Thank you for reading and sorry it has been so long since I have written a post, now I am at Senior School I have lots of homework and can’t blog as much as I used to BUT Project Indigo is still going strong and I will try my best to get about in my TARDIS as much as I can. ALLONS-Y! I hope you all had a wonderful Christmas and I hope you enjoyed The Husbands of River Song (2015) as well! It was an amazing Doctor Who story to watch at Christmas and I really enjoyed it, I’m just sad that we now have to wait a long while until the next new episode comes! “the most magical forest on the face of the earth”. Highlight the following text to reveal the spoiler! When I saw Star Wars Episode VII I instantly recognised Puzzlewood in the scene on the planet Takodana, where Rey takes BB-8 to the woods for safety and bumps into Kylo Ren…..
DON’T BLINK! Do you remember in Flesh and Stone (2010) when the Doctor, River and Amy are being chased down by the Weeping Angels? Puzzlewood was the filming location for the cybernetic forest on board The Byzantium which provided the passengers with air. As they travelled through the forest, poor Amy had to keep her eyes shut as she had a Weeping Angel in her eye. Luckily for me I didn’t run into any Weeping Angels when I was there! No sign of any Weeping Angels, phew! Puzzlewood was also a filming location for The Time of the Doctor (Christmas Special 2013), Matt Smith’s final episode which saw the Eleventh Doctor regenerate. In this episode the Doctor and Clara were attacked by the Weeping Angels in a frosty land – rescued only by the old Key in the Quiff Routine! 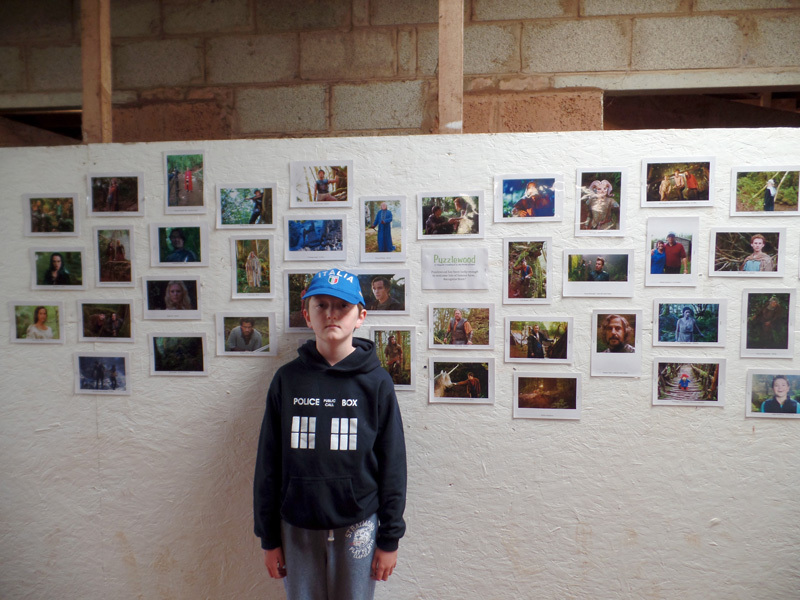 The Puzzlewood Wall of Fame! Apart from Star Wars Episode VII and Doctor Who, other things filmed at Puzzlewood include Atlantis, Merlin, Wizards vs Aliens ( written by Russell T Davies) , Jack the Giant Slayer and Tree Fu Tom which stars Sophie Aldred aka Ace and the Tenth Doctor David Tennant! Puzzlewood is so popular because of its very special scenery and it looks amazing on screen.There is a wall of photos inside showing the many programmes and films that have used this location and you can spot many famous actors who have filmed here. I wonder what is around the corner? On show at Puzzlewood, Scowles are the geological feature. Scowles are found throughout the Forest of Dean and are ancient caves formed millions of years ago in the carboniferous limestone that have come to the surface due to erosion. The rocks are covered in a feathery moss and there are bright green ferns that make the forest so green (and the trees are so green too!) that it is the greenest place I have ever been. It is said that Puzzlewood was the inspiration for the forests of Middle Earth in JRR Tolkein’s books, which sounds pretty reasonable to me! I had a really nice time at Puzzlewood and enjoyed getting lost in the woods and trying to figure my way out -it was a real puzzle! I found many things including a magic doorway and dinosaur feet. The weather changed all the time and it got wetter and muddier as the weather changed from good to bad, good to bad. The mud got more slippery and more slippery and I ended up with my first Project Indigo related injury – a banged collar bone and very muddy trousers! 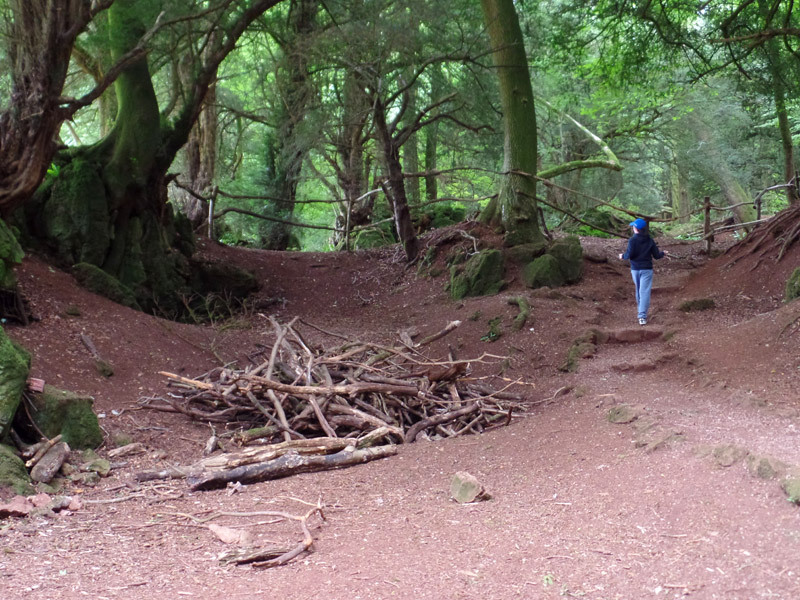 Top tip – if you visit Puzzlewood, wear old clothes and wellies :). I found the dinosaur feet! I found the magical doorway! 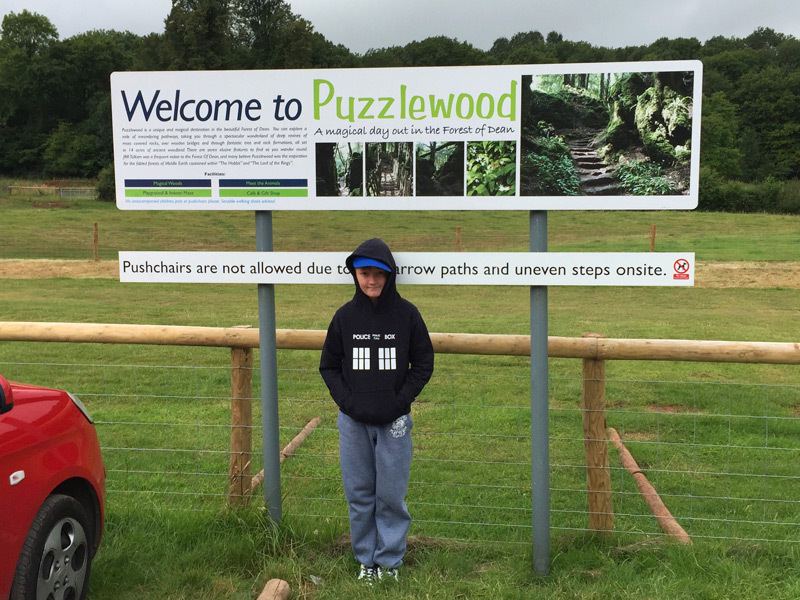 Puzzlewood is a must visit place for fans of Sci-Fi and Fantasy of all ages! Thank you for reading and I hope you will join me again for my next Doctor Who adventure – and I wish all Project Indigo readers a Happy New Year for 2016! Croeso and welcome back to another Doctor Who locations post! Timey-wimey stuff! 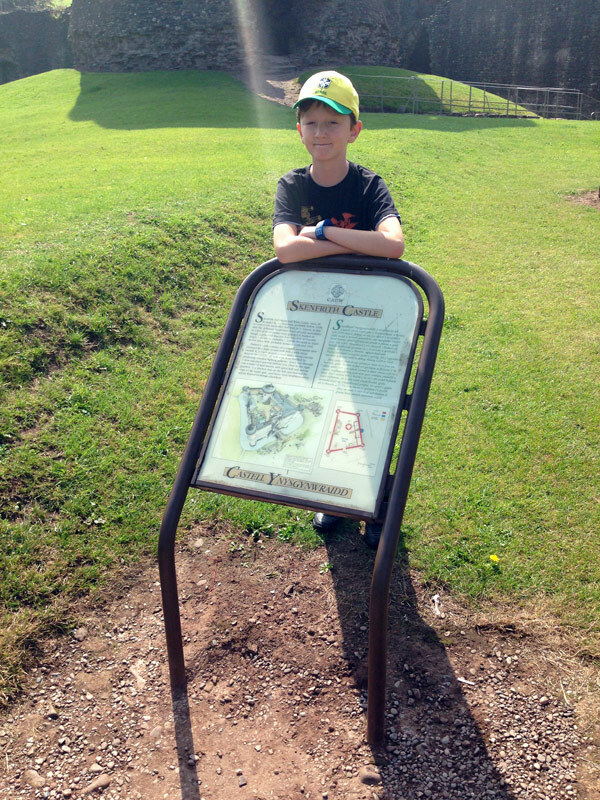 Today we are travelling back in time again in my TARDIS to August 2014 and visiting Chepstow Castle in Monmouthshire. This is where The Day of the Doctor (2013), the 50th Anniversary Special was filmed and I wanted to see where the Doctor married Queen Elizabeth in England 1562! 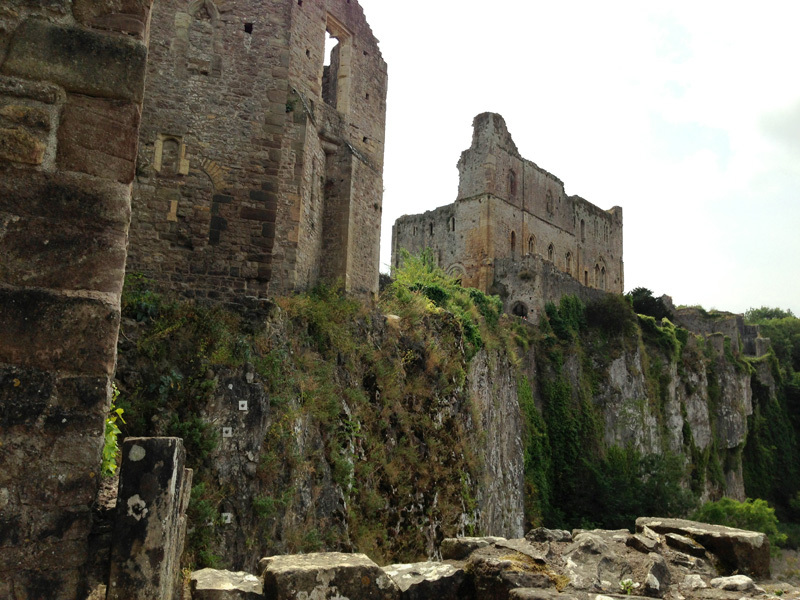 Chepstow Castle was also used as a filming location for the monastery in the Doctor Who two-parter The Rebel Flesh and The Almost People (2011), and also Merlin, the 1980’s TV series Robin of Sherwood ( not Robot of Sherwood ) and Ivanhoe – which was filmed 102 years ago! Chepstow Castle is on a cliff overlooking the River Wye. As you can see in the amazing shot in the episode when the Doctor and Elizabeth are first seen, it is breath taking stood on top of the cliff looking out over the valley. This Norman castle is the oldest still-standing stone fort in Britain. It was built in the 11th Century and started just a year after William the Conqueror’s invasion of Britain. It was built by William Fitzosborn, a relative and friend of William the Conqueror, who became the Earl of Hereford. Until the late 14th Century the Normans called the castle ‘Striguil’ from the Welsh word ystraigl meaning “river bend”. 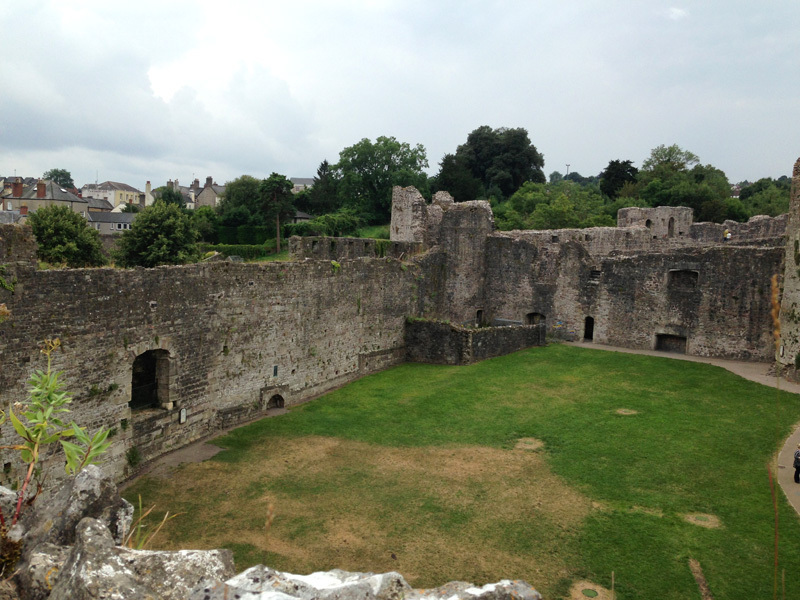 Chepstow Castle is managed by CADW who conserve Wales’ heritage, and I have been to many Doctor Who locations looked after by CADW including Caerphilly Castle and Neath Abbey. I had a great time at this castle and explored all around. 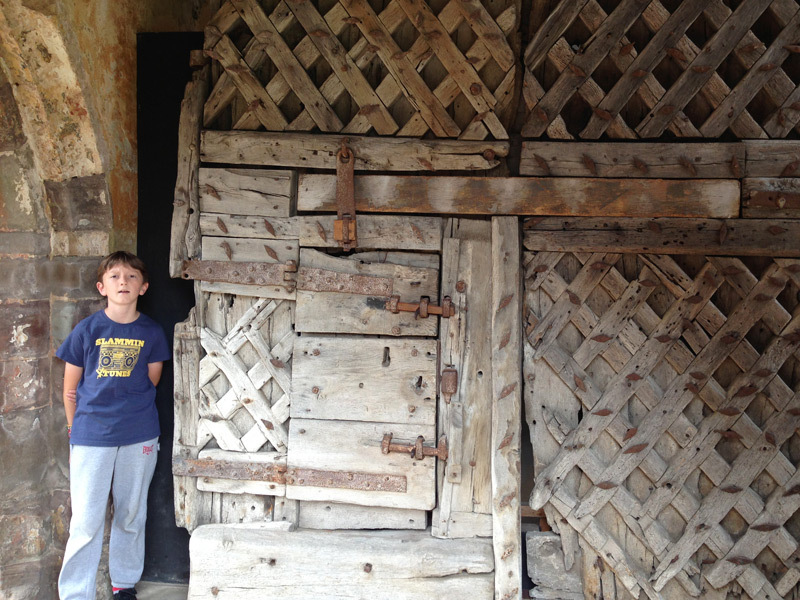 I saw the oldest castle doors in Europe (800 years old and made of wood!) Imagine all the history that these doors have seen! 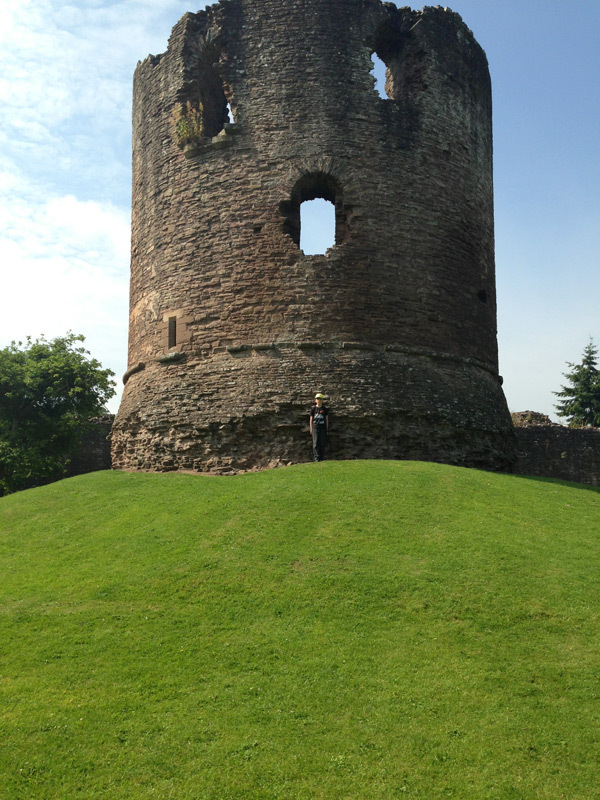 I walked along the battlements and climbed a tower and had a fantastic view of Wales. I even saw the scariest toilet in probably the whole world – the scary thing is that it is over a cliff. Aaaaargh!! I saw where the Tenth Doctor and the First Elizabeth got married, watched by the War Doctor, Eleventh Doctor and Clara. Clara threw confetti over the couple as Elizabeth gave the Doctor a very big snog! Then the Doctors and Clara went ‘back to the future!’I wonder if they saw Marty McFly? I spoke to the Chepstodians about Project Indigo and how I like to follow in the Doctor’s footsteps. One of them was there when the crew were filming and she told me that they had built the Zygon’s nest in the castle cellar! She was so lucky – if I could watch Doctor Who being filmed I would be so happy. 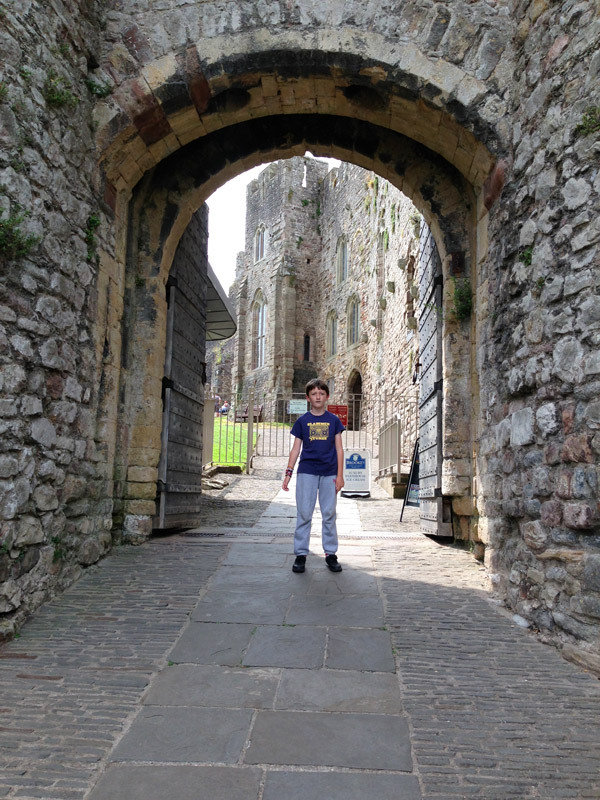 Chepstow Castle was the first location I visited on my Welsh adventure last August and I am happy to say I will be going back to Wales again this summer to revisit my Welsh roots – and visit some more Doctor Who locations of course 🙂 . I’m sorry there has been a delay with this post – I have had computer trouble but I made it in the end. 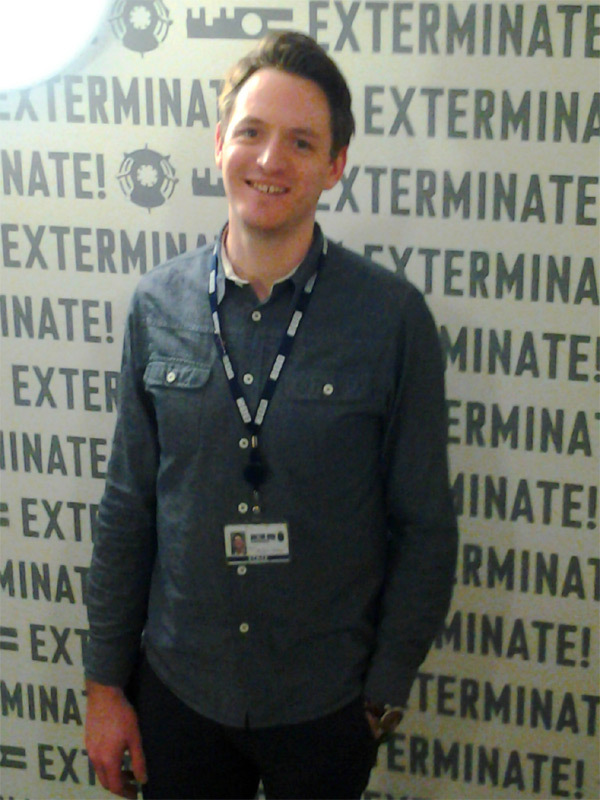 Thanks for reading, I hope you will come back and join me again for my next Doctor Who adventure! 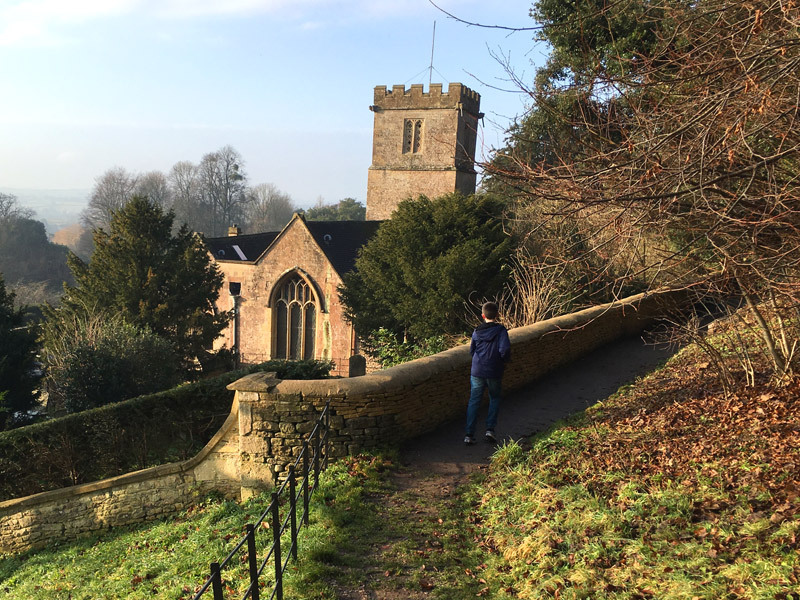 lately there has been a lot of grotty weather so lets go back in time again and go to yet another Welsh location – Llandaff! 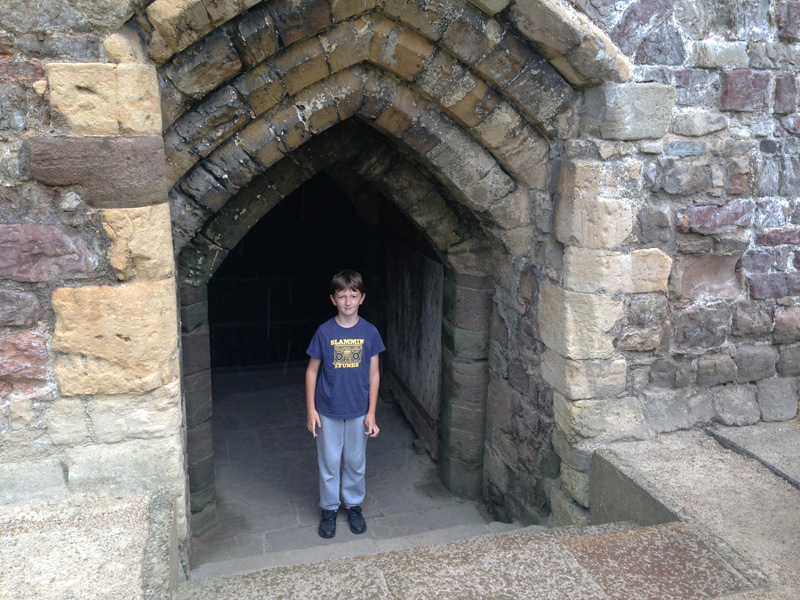 My holiday in August 2014 was so much fun and I love to remember and tell you all about it! 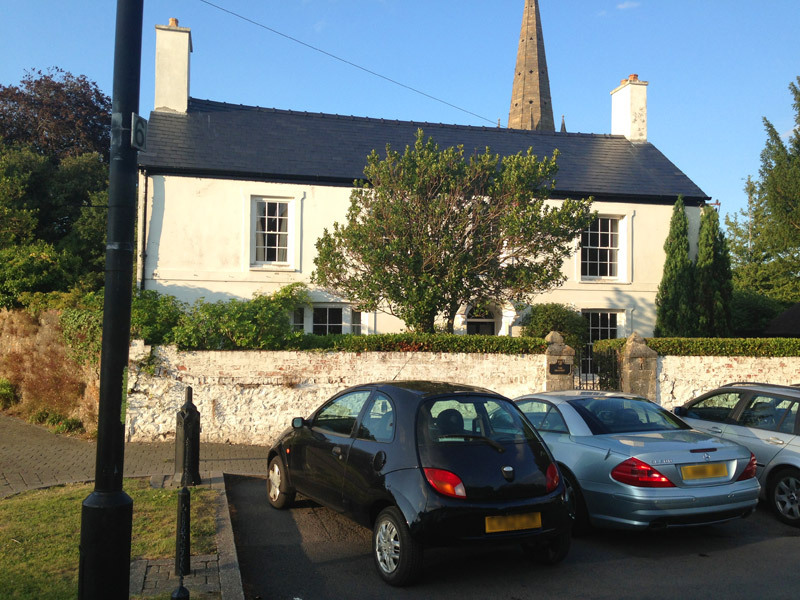 Llandaff is north of Cardiff City Centre, beside the River Taff. It is famous for being the birthplace of Roald Dahl, the author of children’s books and Terry Nation – the creator of the Daleks! I arrived there on a nice tranquil summer’s evening. I picked a great night to go as I was there on the day of the 100th Anniversary of the outbreak of the 1st World War, and the Welsh National Service of Remembrance was being held that night in Llandaff Cathedral. 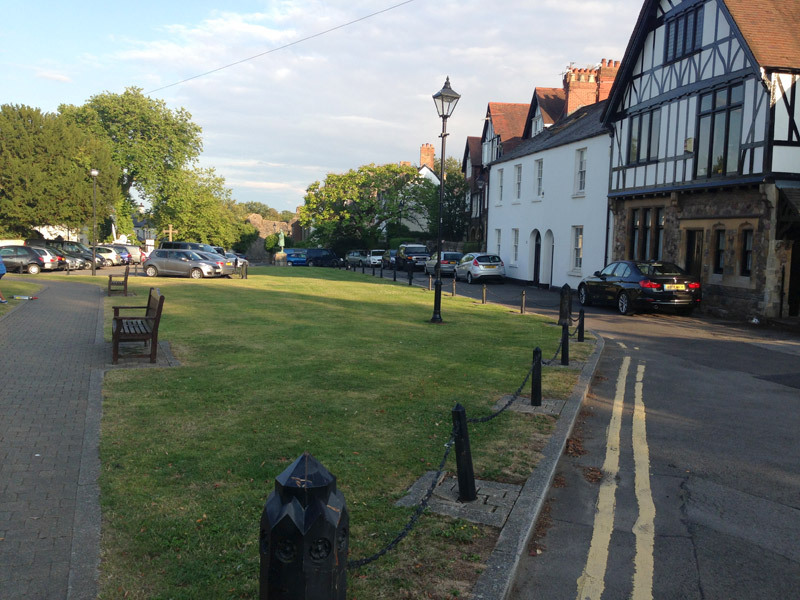 This location was used in the episode The Eleventh Hour (2010) under the name of Leadworth, the home of Amelia Pond. This was where the newly-regenerated Doctor first met Amy and he investigated the village to find Prisoner Zero to save the world from incineration by the Atraxi! When he met young Amy she was worried about the crack in her wall. Did you know that Steven Moffat came up with the idea after looking at a crack in his ceiling? 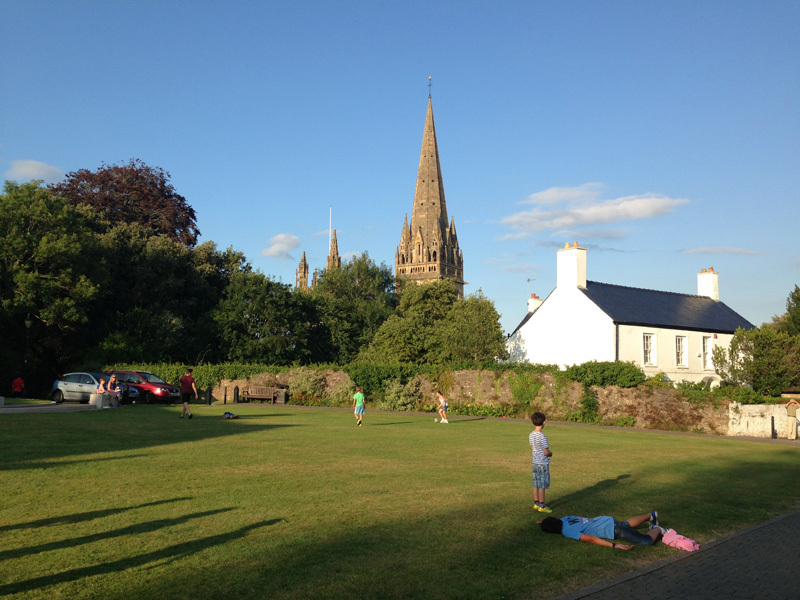 Once I got to the middle of Llandaff I saw some kids playing football in the cathedral green where the Raggedy Man first met Rory. I asked them if I could play and I got a match! I didn’t score any goals but I got an assist, so that was good. It was a great match that I really enjoyed playing even though the team that I was on lost. The green seemed much smaller than on the TV. There was no sign of the duck-pond without any ducks! That was just built for the episode and is not there in real life. There was no exploded phone box either – lots of details were added to make Llandaff look like a typical English village. 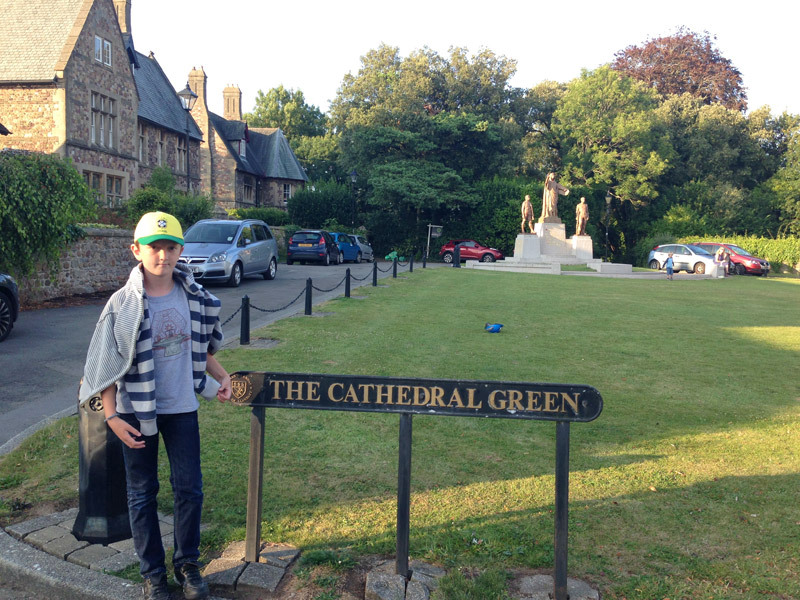 At one end of the green is a very special statue which is the Llandaff War Memorial created by Sir William Goscombe John. 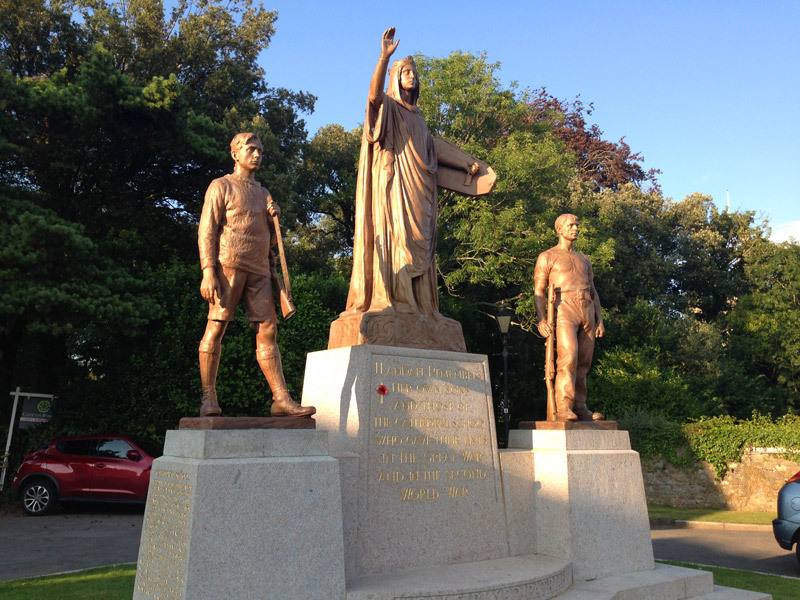 It is called The Memorial Group, and used to be called ‘The Departure’. There are three stones with a female figure in the middle, which represents Llandaff, and beside her is a workman, representing the village, and a cadet representing the school. You will recognise this statue from The Family of Blood ( 2007) when Tim Latimer attends a Remembrance Day Service as an old man, watched at a far distance by the Tenth Doctor and Martha. After the match I went to walk around the cathedral whilst the World War 1 Commemoration preparations went on inside! 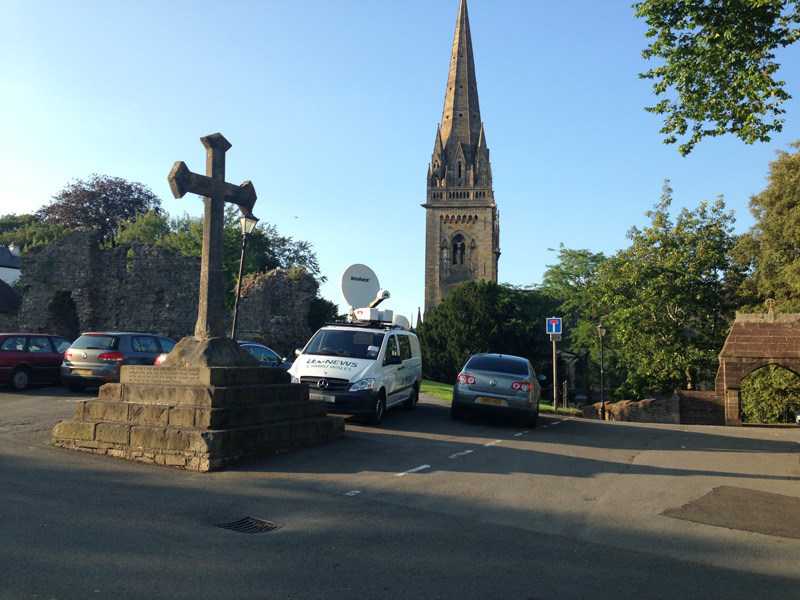 I saw some people filming outside of the church for BBC and ITV News as I walked around to tire my feet out. It was fun exploring about the grounds and watching the guests arrive for the service. There was no sign of Prisoner Zero or a giant Atraxi eye floating above the spire! Llandaff Cathedral is also the location of the wedding of John Smith ( the Tenth Doctor) and Nurse Redfern in the Family of Blood ( 2007) and of course is it the Church of Auvers from Vincent and the Doctor (2010) where the Eleventh Doctor, Vincent and Amy confront the lonely Krafayis. Luckily there was no sign of the Krafayis either! My heart goes out to all the people that fought and lost loved ones in the war. My first anniversary of blogging will come soon and to celebrate Project Indigo’s first birthday I will be holding a mega epic competition; please don’t miss it!I’m welling up with excitement and can’t wait to tell you about it! Thanks for reading ! Gooooodbuy! Hello – is this a dream or is it reality? I don’t know, you choose! 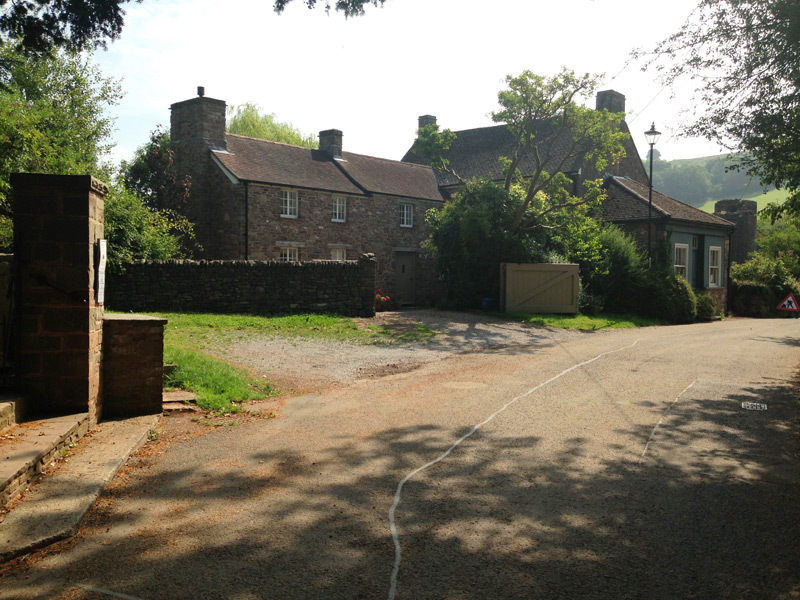 Today we are travelling back in time again to my summer holiday in Wales, and visiting Skenfrith – a filming location for the Eleventh Doctor episode Amy’s Choice ( 2010). Before we start I would like to tell you two facts I have learnt this week. 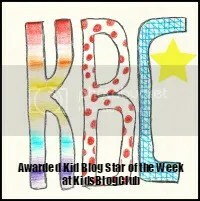 Firstly I became Kids Blog Club‘s first ever Kid Blog Star of the Week which was quite good. What am I saying? It was AMAZING! Secondly, Project Indigo has now reached 10,000 views. Woooh – hooo! Thank you all so much for helping me do this, I hope you have enjoyed reading about my adventures so far and will keep reading about them in the future. Now, time to get on with the post. 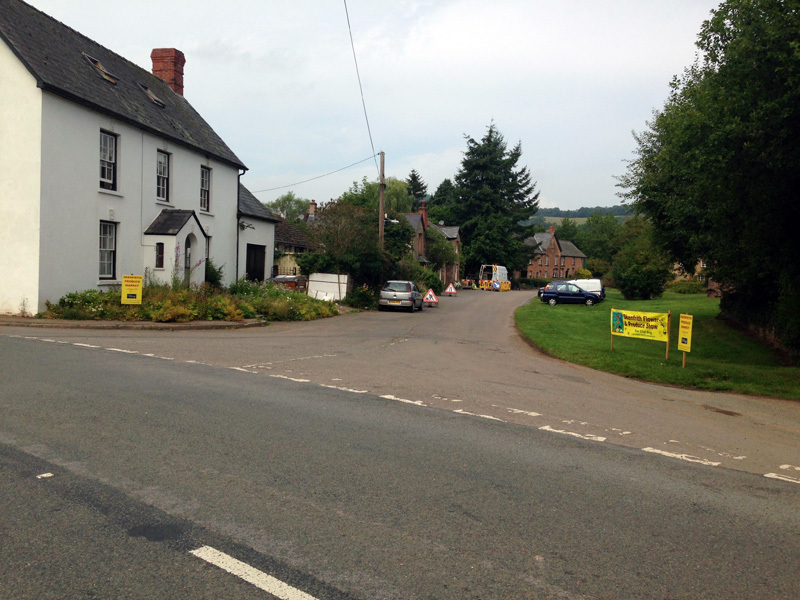 Skenfrith is a small village near Abergavenny in Monmouthshire, South East Wales and is close to the English border. On the way there my TARDIS got stuck on a never ending muddy road and it took me a while to find it! When I landed my TARDIS I could recognise that I was in Upper Leadworth where Amy is pregnant and Rory has a pony-tail. Or is it? Are they just dreaming? Are they in Leadworth or are they in the TARDIS slowly freezing to death? 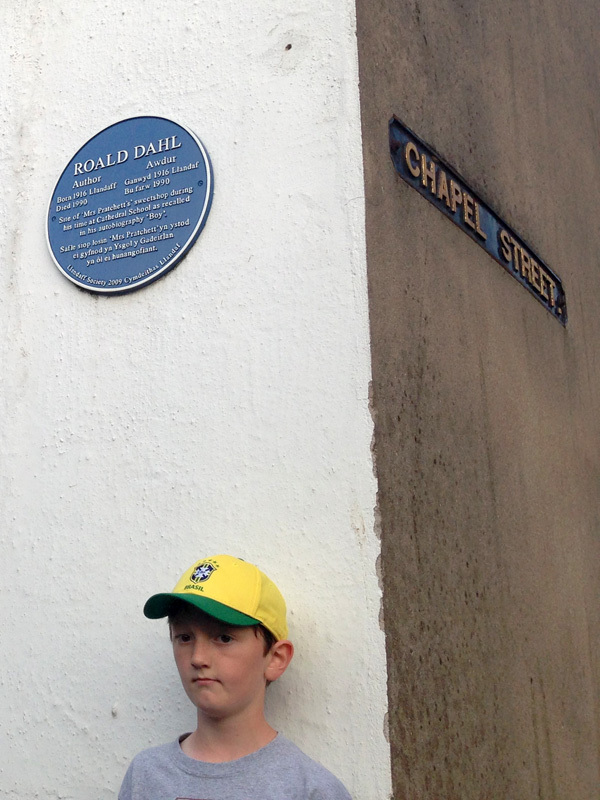 Luckily for me there was no sign of the Dream Lord when I visited – or was there? I don’t know! It was all so confusing, just like in the episode. When I parked my TARDIS it was right opposite Sarn,the Residential Care Home where the Eknodines lived in disguise as VERY old people. Straight away I went across to Skenfrith Castle, or what is left of it. In Amy’s Choice this is where the children were playing on a school trip. The Doctor, Amy and Rory fell asleep and woke up to find the children have been turned to dust! I was pretty brave to go there, wasn’t I? The play park was not there anymore which was a shame as I was looking forward to playing on the swings like the Doctor, and saying ‘bow-ties are cool!’. 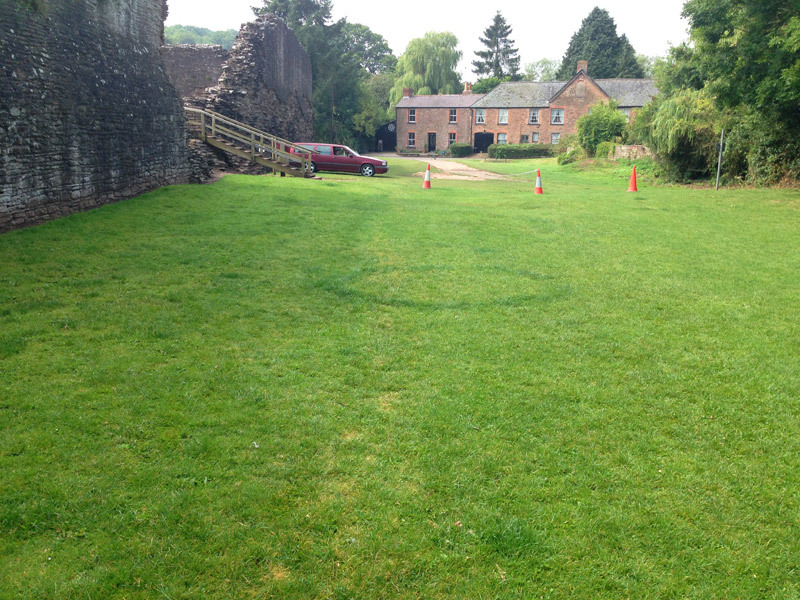 But there was a mysterious circle in the grass, maybe the ghost of a roundabout? 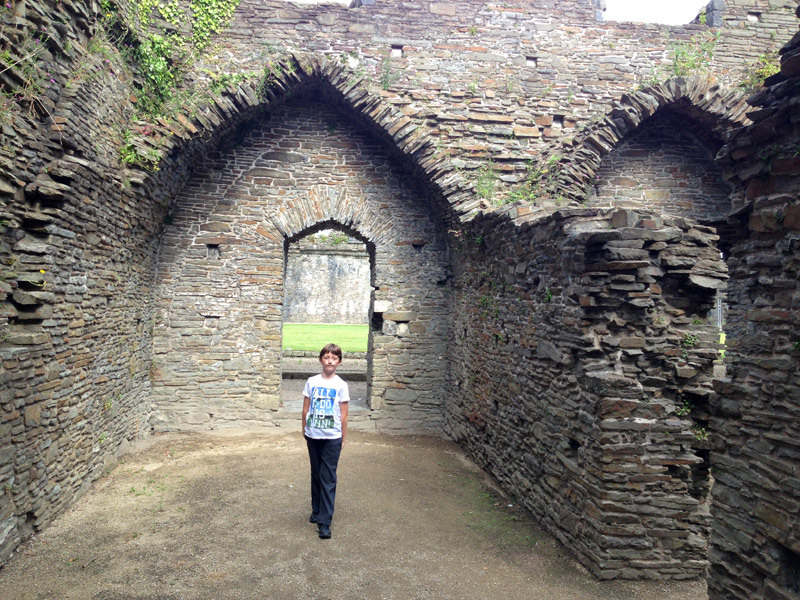 Skenfrith Castle is managed by CADW and the National Trust and it is free to explore. 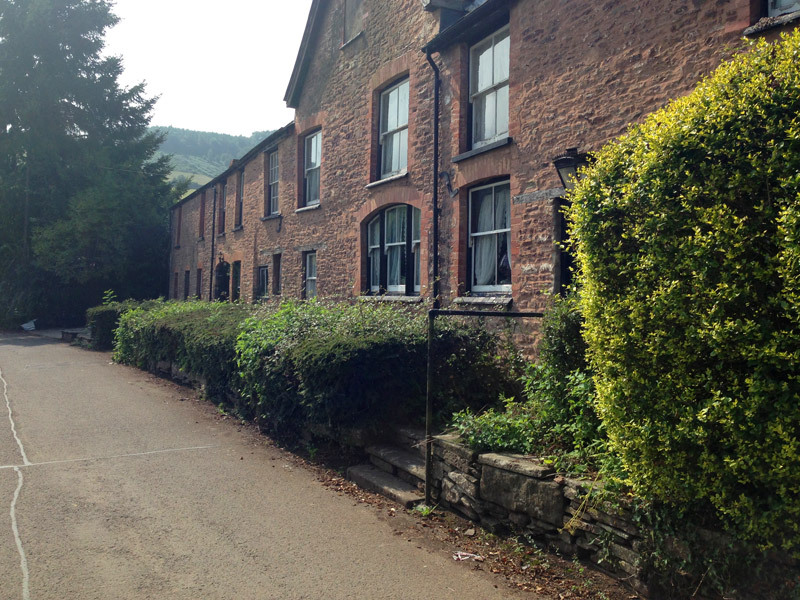 It is in the centre of Skenfrith on the banks of the River Monnow. 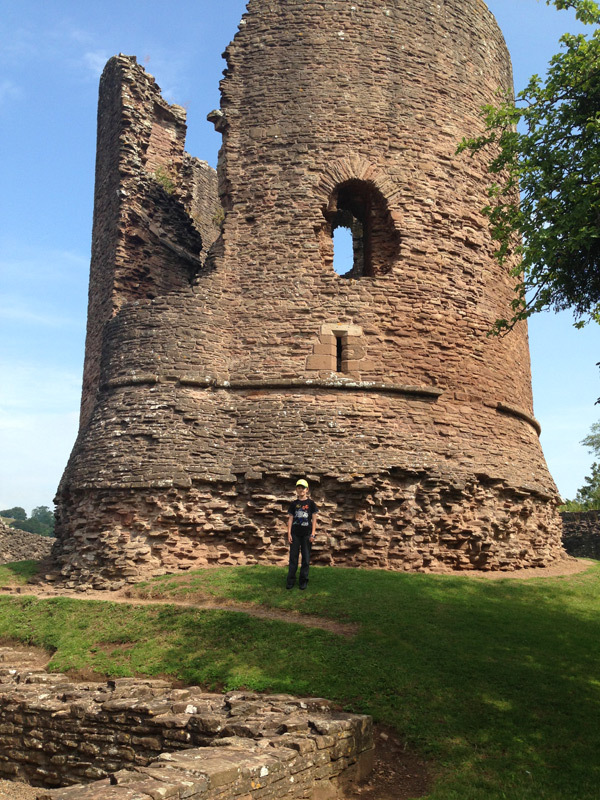 Along with White Castle and Grosmont Castle it is one of the ‘Three Castles’ in the Monnow Valley built during the Norman Conquest. It was probably built in the early 13th Century by Hubert de Burgh. 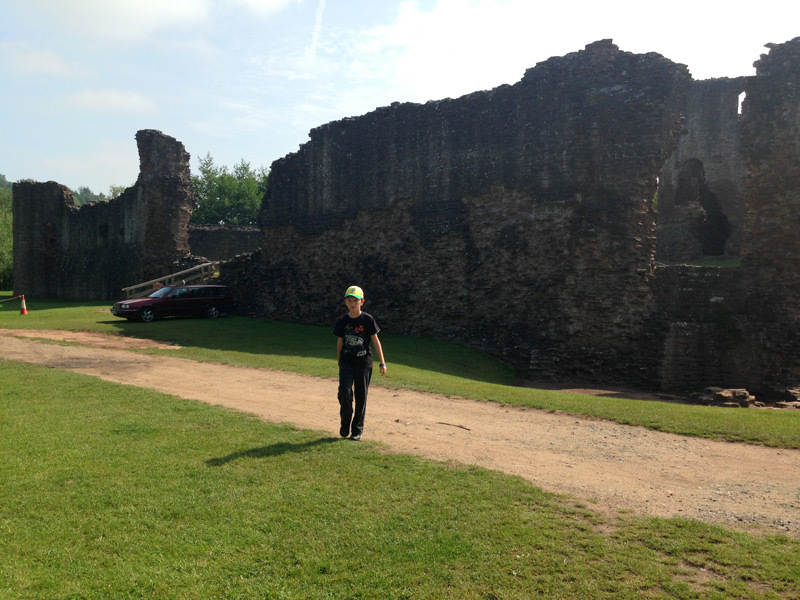 It was fun exploring the ruins and it was amazing to be in an 800 year old ex-building! Next I explored the village which the Doctor raced around in a camper van rescuing the young people. Much of the village is built with stone that was originally used to build the castle! It was so quiet and peaceful that I did not see anybody – perhaps the Eknodines had come back? In the middle of the village stands St Bridget’s Church which was consecrated in 1207. 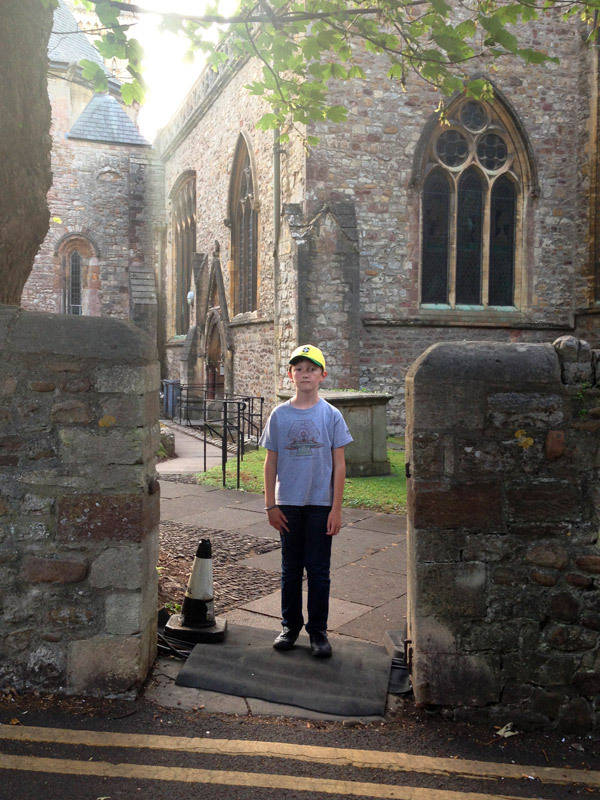 This medieval church is one of the oldest in Monmouthshire. The original altar stone was hidden in the church floor to protect it during the Reformation! It was at this spot beside the church where the Doctor realised that ‘this one is going to be tricky!’ It was a little bit tricky, yeah! 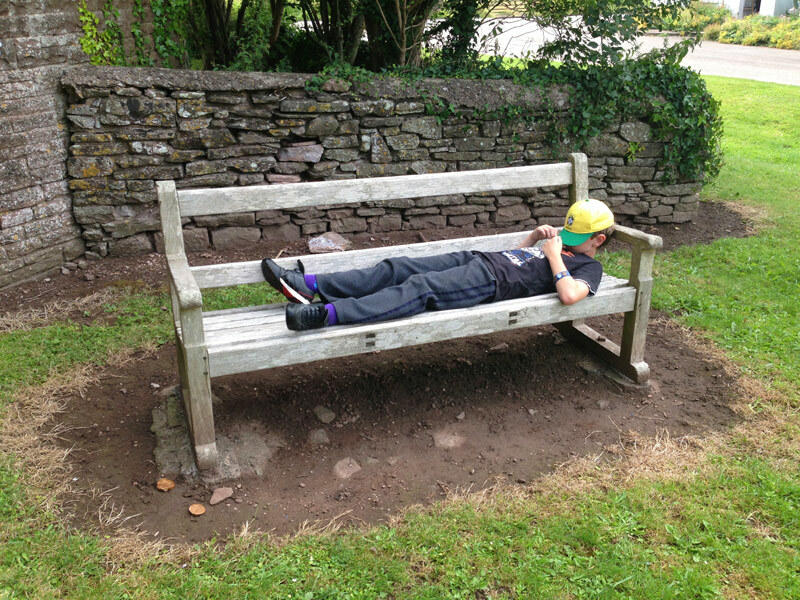 I spent a bit of time looking for the Doctor’s ‘nice benches’ where he, Amy and Rory kept nodding off- there were lots of benches to choose from so I tried them all wondering which one was the one. I might not have found it but it was worth a try! For such a small village there were A LOT of benches! 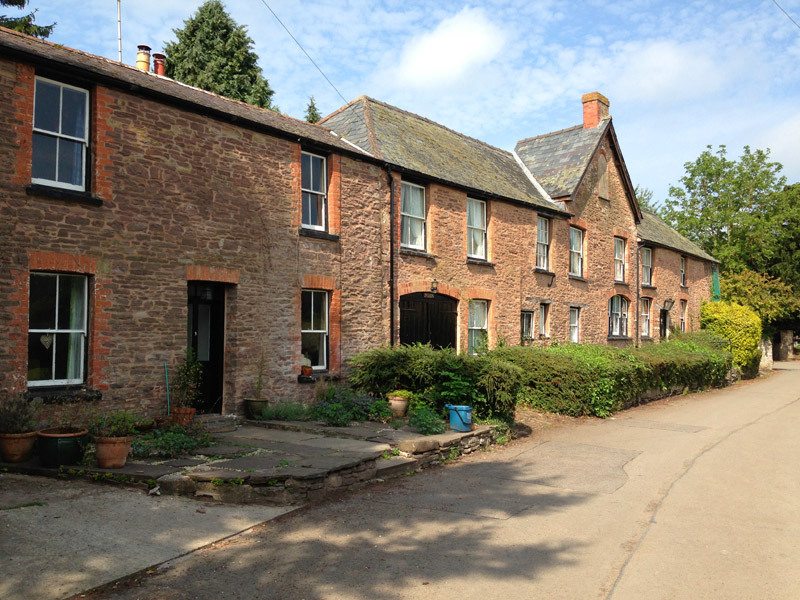 I had such a nice time in the beautiful village of Skenfrith, it was great and I really felt as if I was in Upper Leadworth. I kept imagining that I was in a dream and the Doctor would walk round the corner at any moment! 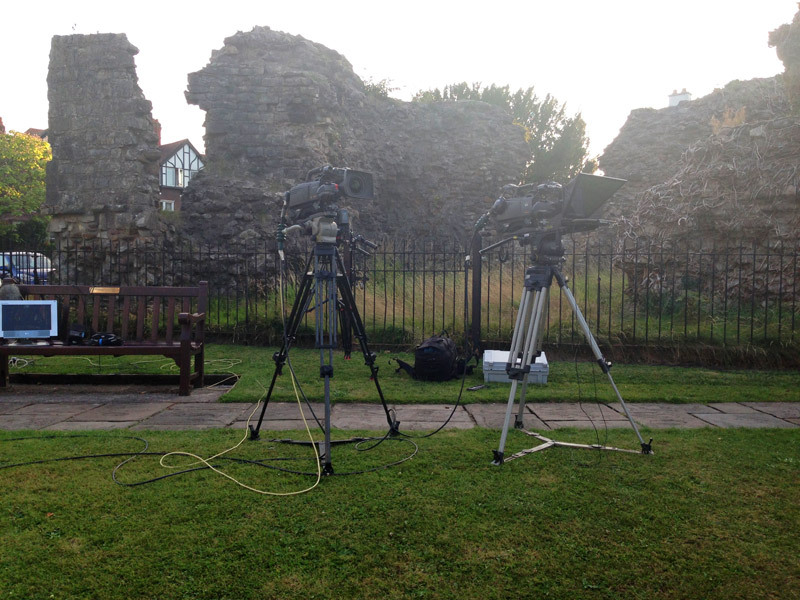 Thank you for reading about my Skenfrith adventure, I hope to see you back again soon. Night night, sleep tight and don’t let the bed bugs bite! Sweet dreams! I am saying ‘Welcome Back’ in Welsh because we are travelling back in time and space again to Wales in August 2014. 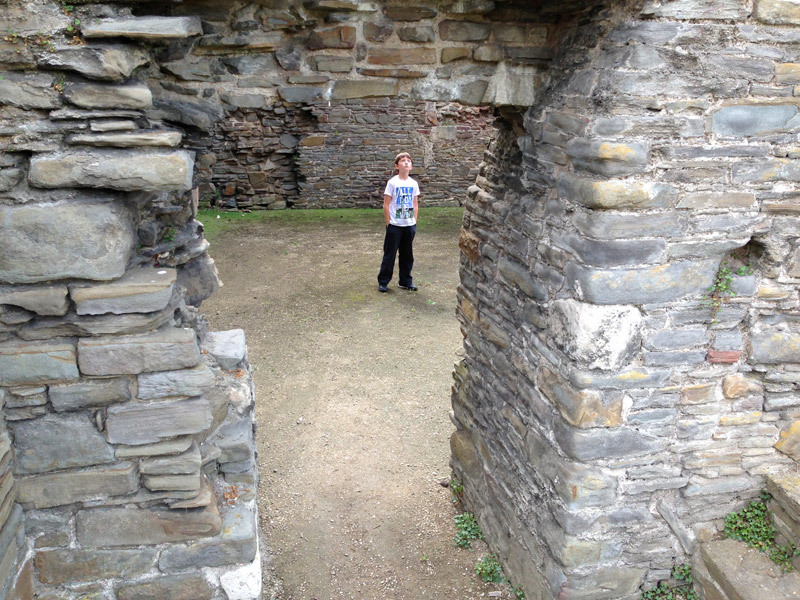 This time we are at Neath Abbey in the town of Neath which has been used as the filming location for several Eleventh Doctor episodes. 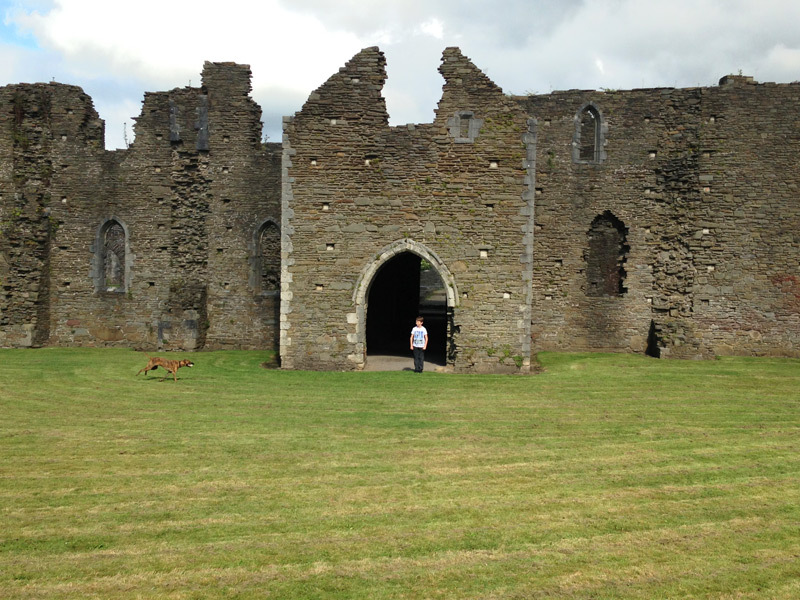 Neath Abbey is close to Neath but it feels away from it all and it is a very tranquil place to visit. 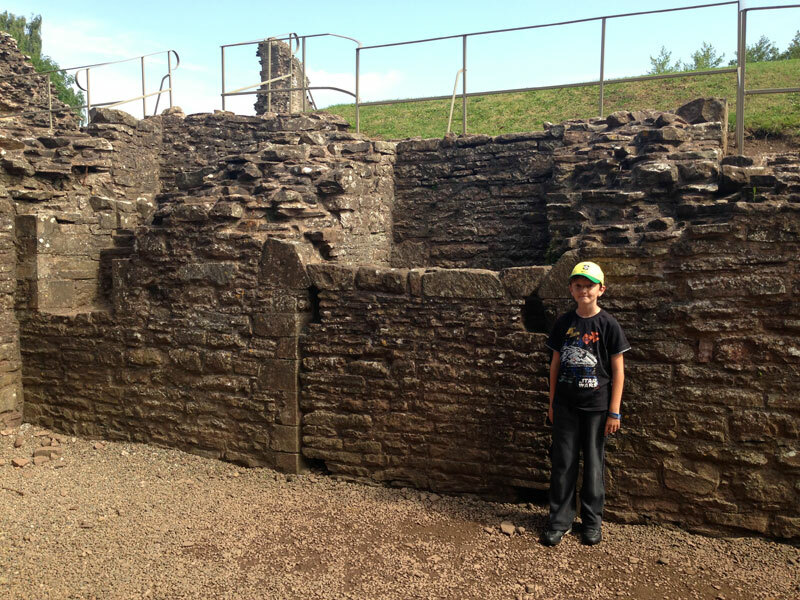 It is managed by CADW who protect Wales’ heritage – CADW is a Welsh word meaning ‘to keep or protect’. Neath Abbey is 885 years old and was first established all the way back in 1129AD by the Norman Richard de Granville for Savigniac Monks from Western Normandy in France. It became a Cistercian monastery in 1149. The abbey remained open until 1539 when the Tudor King Henry VIII dissolved the monasteries. The abbey is now fallen into ruins but you can use your imagination to feel what it was like to be there when it was the largest abbey in Wales. When I visited it was very peaceful and I was alone with my companions. The weather was mild, ideal for exploring the area where, in Vincent and the Doctor (2010), Vincent van Gogh fought the Krafayis – a monster only he could see! Luckily,there was no alien there when I visited. Or was there…? The Control Room in The Beast Below (2010) was also located in Abaty Nedd (what Welsh people would call it) where the Doctor and Liz 10 looked at the brain of what keeps the Starship UK up in space – a Star Whale which was the last of it’s kind ! 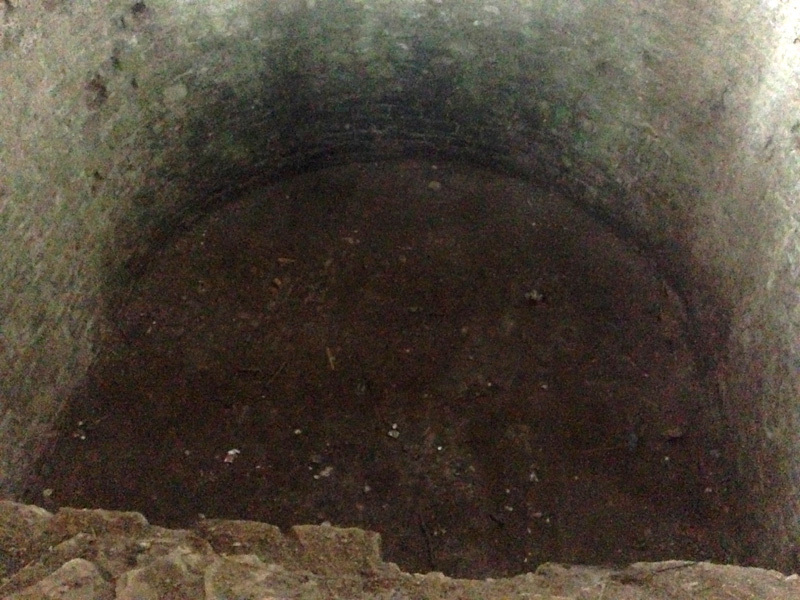 Also , the Gangers in the two- part episode The Rebel Flesh and the Almost People (2011) used a machine in one of the chambers of the monastery they worked in to turn the Flesh into Gangers – again, filmed here at the abbey. I could not recognise any of these scenes; the abbey looked a lot different in real life. The cast and crew must have transformed the whole place to film these episodes! There were also barriers all over the site as the horrible weather we had in the winter damaged the walls and they were not safe. 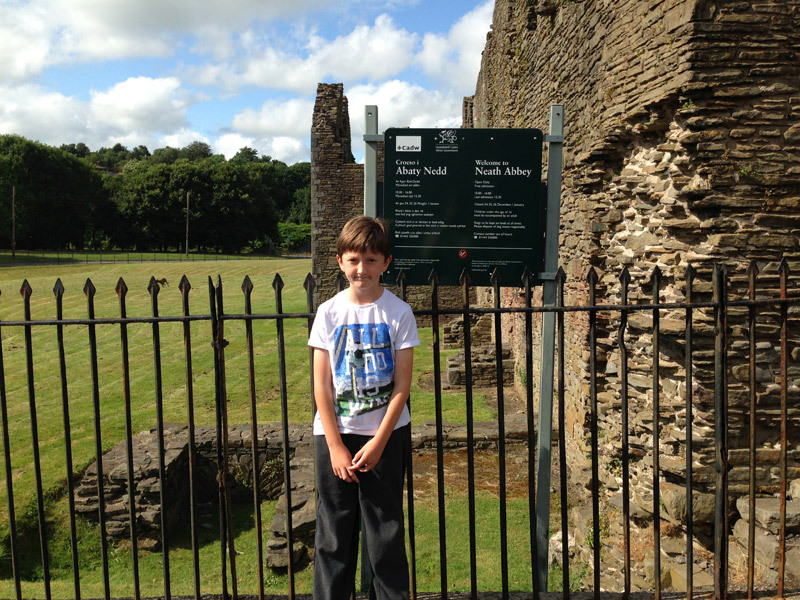 CADW are working to save the abbey from further damage. I spent my time there trying to picture what the abbey would have looked like before it was dissolved and it was, as historian John Leland put it “the fairest abbey of all Wales.” I like visiting ruins because I like to put myself in the same places where history has been made! I think the building is in very good condition for it’s age really. I did make friends as I came out – with a lovely brown dog. We had a fun game of ‘fetch’ and apparently he goes to the abbey everyday for his walk so if you go I hope you bump into him. 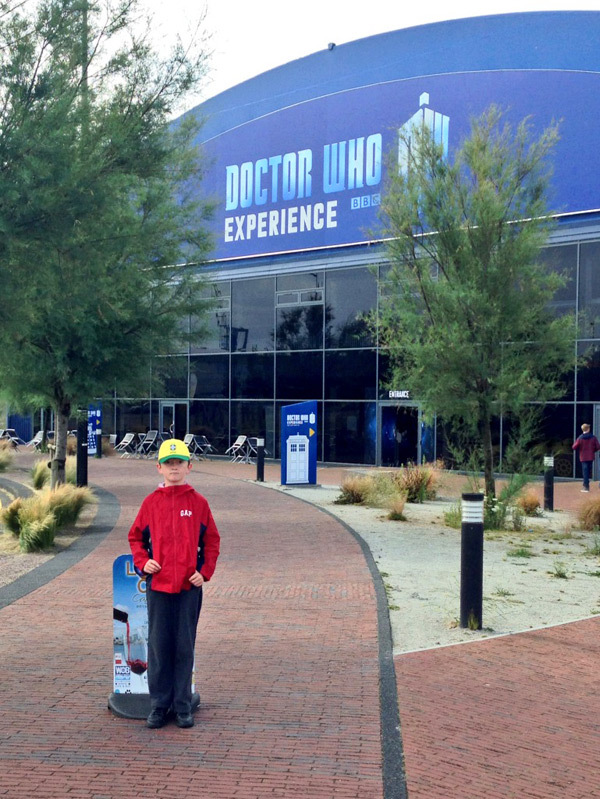 I suggest that all Doctor Who fans should definitely go and visit – it is a great place and it’s free to get in! Thanks for reading – my next post will be about an exclusive Classic Doctor Who location that I was lucky enough to visit at the weekend. I hope you come back and check it out! Dewch yn ol yn fuan! ‘Ello ‘ello ‘ello and welcome to my latest Doctor Who location -Victoria Park in Cardiff. Victoria Park is in the Canton area of Cardiff. 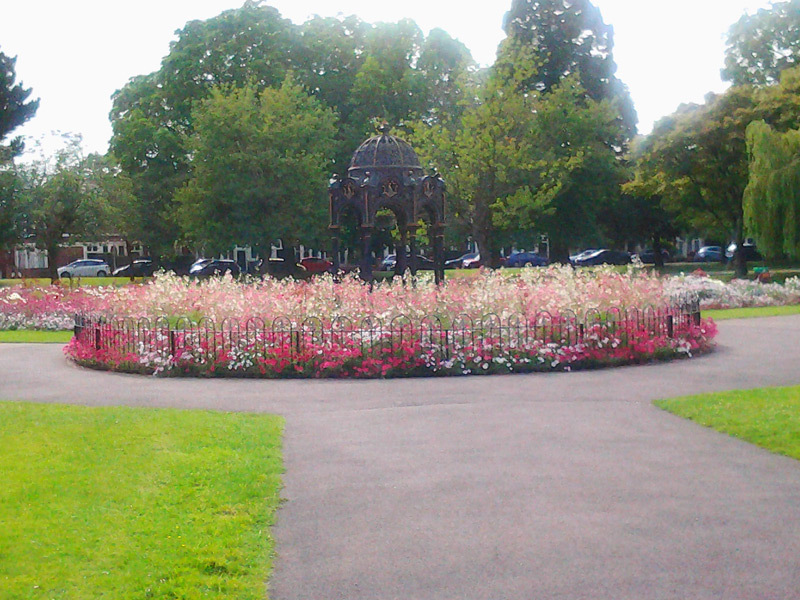 It is a late Victorian public park, opened in 1897 and named in honour of Queen Victoria’s Diamond Jubilee. There is lots to do there including a child’s playground and paddling pool, basketball and tennis courts, a bowling green and the only pitch in the universe that the Doctor has played football on! I would like to thank www.doctorwholocations.net for helping me find this location. http://www.doctorwholocations.net is a great website to visit because it tells you everything you need to know about Doctor Who locations and I really wanted to find out about this location. I am a big fan of football and I was desperate to find this place because it is the location for the Eleventh Doctor’s football match for the King’s Arms. In The Lodger (2010) the Doctor moves in with Craig for a little bit and gets to play in his pub footy league! When I arrived there were lots of people so it was hard to see the footy pitch but I got there eventually. There was no sign of the Doctor and Craig playing football but at least I got to have a kickabout! I met George and Dan who were passing the ball to each other and they asked if I wanted a game. You know what happened next, don’t you? That’s right – I got a match! 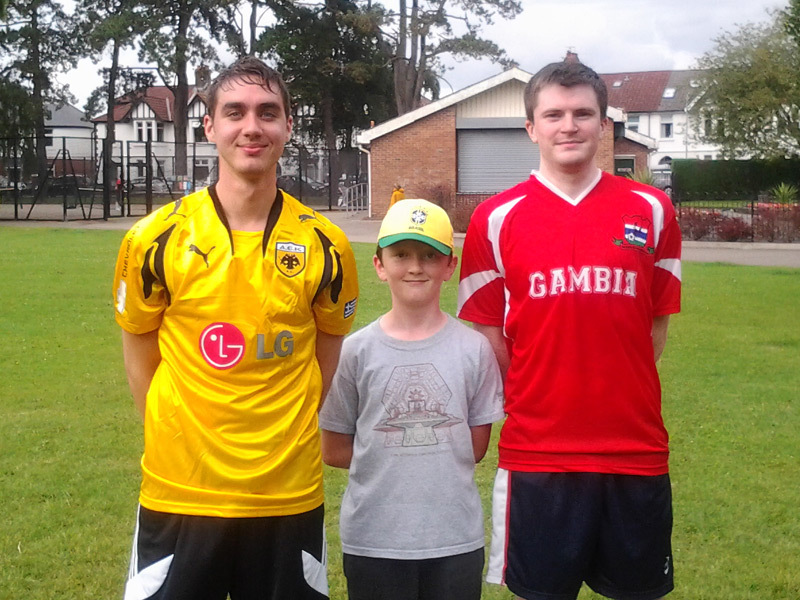 George and Dan helped me improve my football skills by teaching me passing and shooting. I got about 6 goals past them! I didn’t get as many as the Doctor – when I last watched The Lodger I counted that he scored 8 goals. The Doctor loved playing football! In real life Matt Smith played for Northampton Town , Nottingham Forest and Leicester City’s Youth Teams but had to give up football because of a bad back injury. Aw! But then again, not aw, because if Matt had played professional football he would never have been the outstanding Eleventh Doctor. I was really happy to play on the pitch where Matt Smith’s footsteps have been. George and Dan really helped me so I’d like to thank them for a great game – thanks guys! As my match ended I left the pitch and went to the bandstand to take shelter from the rain. 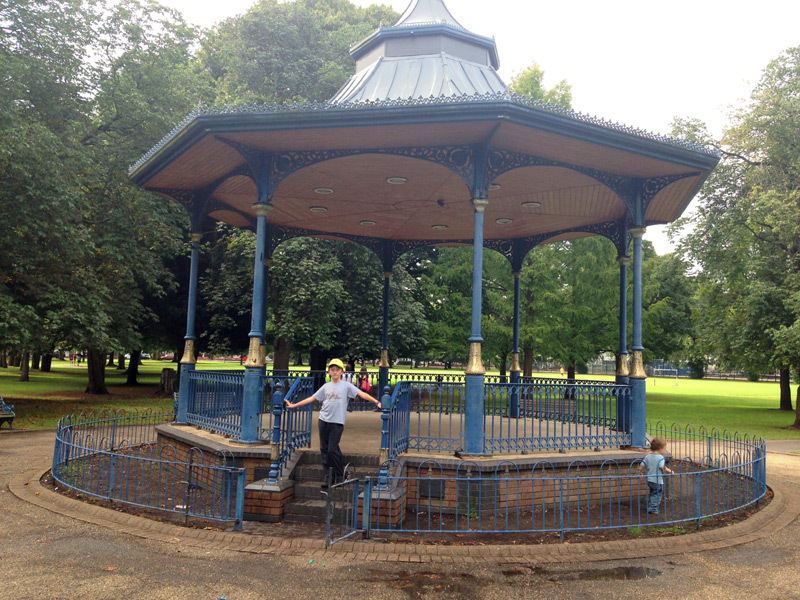 This is the same bandstand where Donna met Miss Evangelista in The Forest of the Dead (2008) and she learns that her children are virtual reality and she is not a mother after all! The bandstand does not look old, it is a replica of a Victorian bandstand and was built in 1995 with money from the National Lottery. 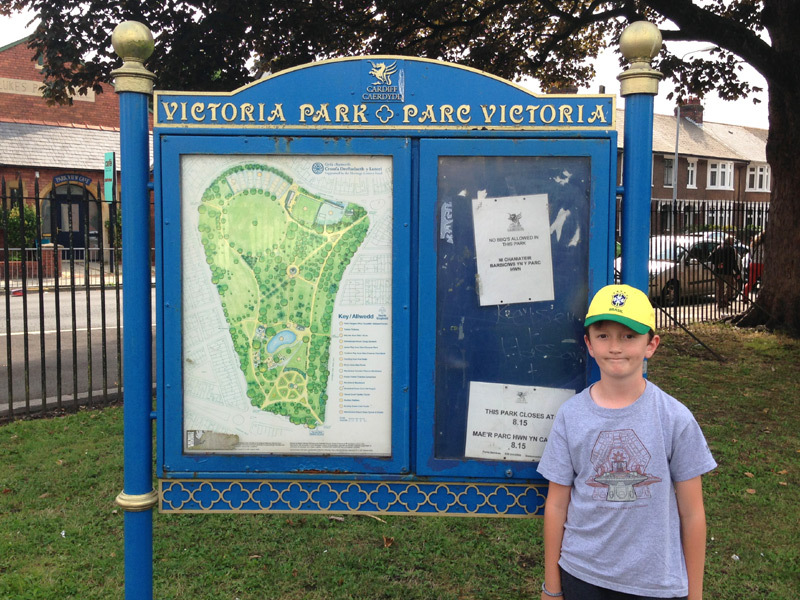 Victoria Park is a great place to go to and is especially good if you like to have a kickabout or a splashabout! I had a smashing time there and hope you get a chance to come here and enjoy the park. Thanks for reading, and see you next week. Please leave a comment to let me know if you have been to any Doctor Who locations, I would love to hear about it! Ok, match is over, Full Time – Pheeeep! Goodbye! We’re back in Cardiff for another post for you. We are off to The Doctor Who Experience on the 4th August, on a lovely sunny day and I am so excited. I am going to the door and ooopps, sorry CLOSED! Retake! Awwww! But I walked around the side and noticed some SFX trucks. There was some filming going on in there! I wonder why…… A Christmas Special? Five-ish Doctors Sequel? A new intro? I’d love to know. Now it is the next day, sorry about that, now it really is open and I went in to see the action. I didn’t have to pay because I used my Blue Peter badge! It was very busy (like it always is) because the Doctor is famous worldwide and this is THE place to come to if you are a Doctor Who fanatic. I have been there three times now- August 2014, February 2014 and August 2011 when it originally opened in Olympia in London, before it moved to Cardiff. I came back to see the Eleventh Doctor, Matt Smith, for the final time before the Experience closes on August 31st to change over to the Twelfth Doctor. 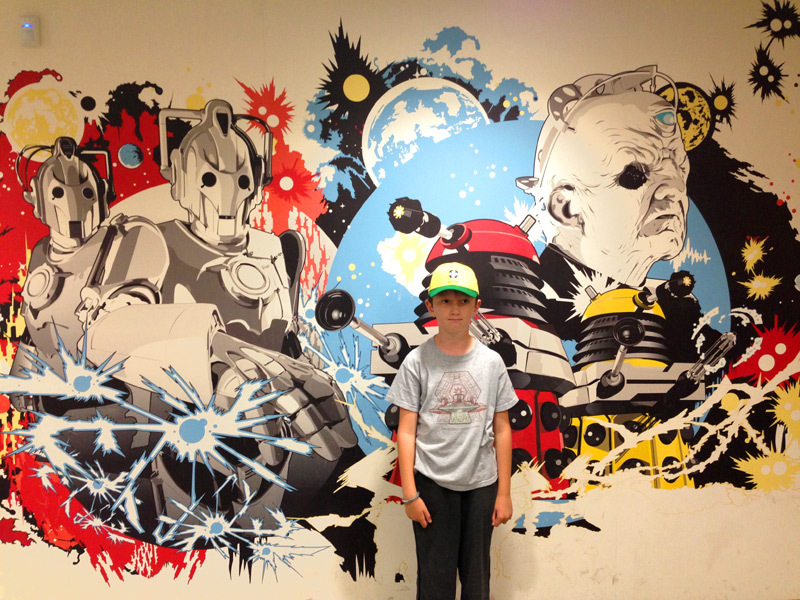 Inside the walls are covered with loads of fantastic Doctor Who artwork. I don’t know who did it but they are a great artist and I wish they could decorate my bedroom! 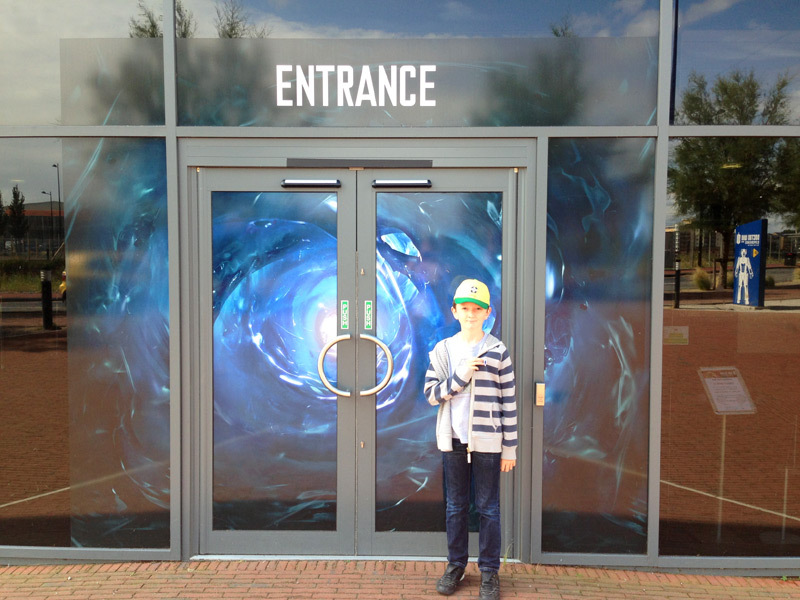 First stop was the interactive experience, it was my last chance to save the Eleventh Doctor from the Pandorica. I stepped through a crack in time and went on a real journey through time and space! First up, Starship UK then I went into the actual TARDIS which really was bigger on the inside, it’s true. I met the Daleks and Weeping Angels and helped rescue the Doctor- who was really silly to get stuck in the Pandorica for a second time! Some children were crying because they were scared but I wasn’t one of them luckily! Straight out, I went to get a photo taken. 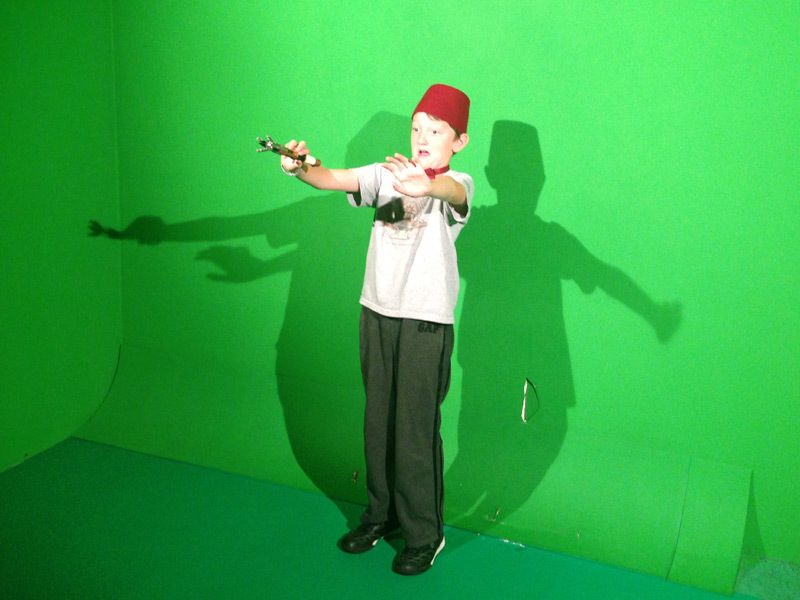 There were lots of props to choose from so I took a Fez, bow-tie and a Sonic Screwdriver. 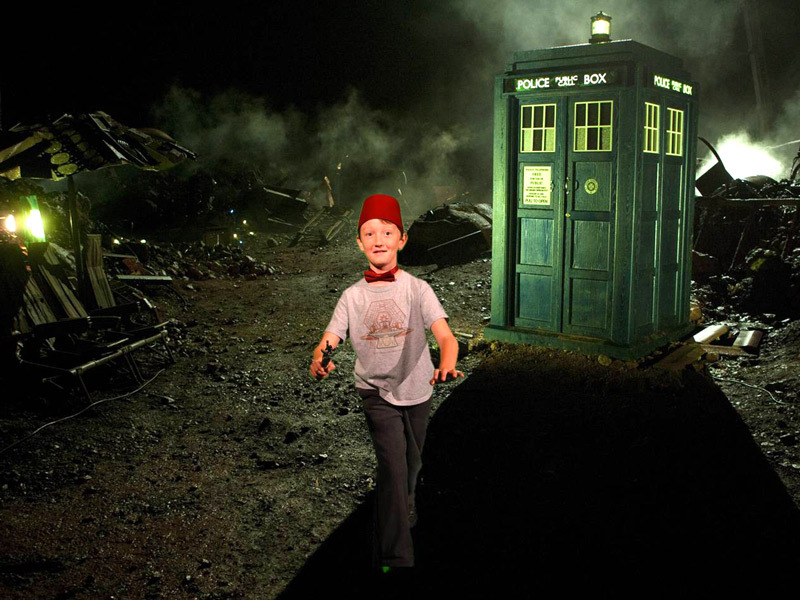 I posed in front of a giant green screen and first pretended I was afraid to be on Trenzalore and then flew the TARDIS. I felt a bit weird because there was a big queue and everyone was looking at me but it was good fun and I chose to buy the photos of me on Trenzalore. I had two photos and they were e-mailed to me as well. Next I travelled around the exhibition. This is actually a filming location, not only for The Day of the Doctor (2013) where they filmed the Tenth Doctor at his TARDIS console but also An Adventure in Space and Time (2013), which is a film about the creation of Doctor Who, and The Five-ish Doctors Reboot (2013), which is a really funny film about the Fifth, Sixth, Seventh and Eighth Doctors trying to get in on the 50th Anniversary episode. I have met Andrew twice, and he is featured in The Five-ish Doctors Reboot as one of the employees who took John Barrowman CDs from the Fifth, Sixth and Seventh Doctor as payment for getting into the Experience! He is a very nice man and let me take a photo the first time I met him. The exhibition has the worlds largest collection of items that have been used for filming – costumes, props and sets. This time there were even more than the last time I went as there were lots of items from the Christmas special, The Time of the Doctor (2013). These included the puppet theatre, Tasha Lem’s bed-shaped altar and poor old Handles, the Cyberman head who helped the Doctor on many occasions and became his best friend when he stayed for Christmas. You can see all the characters including Daleks, Cybermen, Ood, Abzorbalof, Zygon, Smilers, and a bunch of others too many to mention. You can see costumes for all the Doctors and lots of the companions and the Doctor’s old TARDISes. You can control a Dalek, watch some making of Doctor Who films, learn to walk like a Scarecrow and a Cyberman, and listen to the sound effects. Everybody inside is so joyful to see and do all these things and they take lots and lots of photos to remember the day. Everything you see makes you go ‘Wow’! 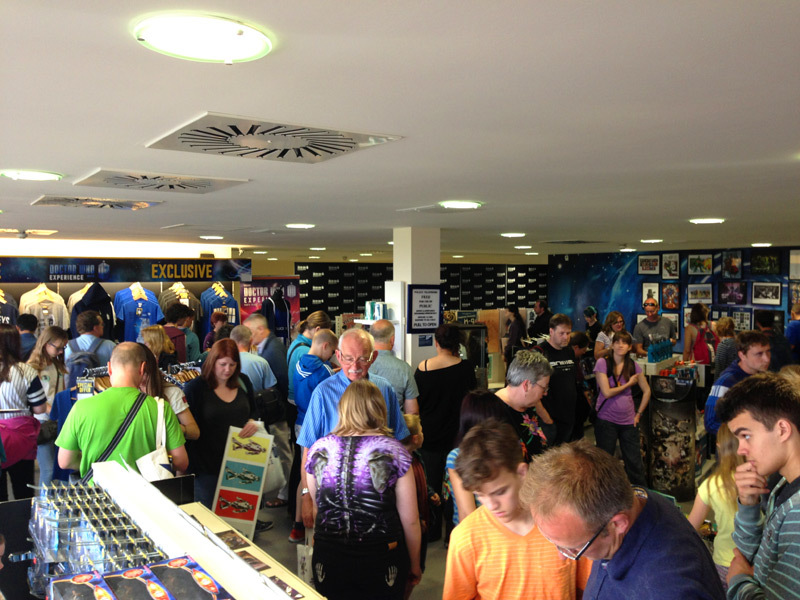 Now we have left the exhibition we are in the shop which is crammed full of Doctor Who items such as pictures, Sonic Screwdrivers, T-shirts and loads of DVDs and magazines to choose from. I bought a Cybermen wristband and a keyring with my favourite Doctor, number Seven on it. I had a brilltastic day and can’t wait to go back again. I hope I get to see the Experience when it has regenerated into the Twelfth Doctor’s story. Have you been there? Please leave a comment and tell me what you liked best. More Cardiff posts coming up soon, byee! Just a little heads up that I’m a goin to Cardiff in the morning and will be visting A LOT of Doctor Who locations this week. I will have a very special surprise in store for you readers when I get back! I wish everyone a good week and I will make a post as soon as I get back. ‘The library. You were mentioned in a book. You call yourself Doctor. Why do you do that? You have a name. I’ve seen it. In one tiny corner of that tiny book’. It is a very scary episode but luckily when I was in the library there was no sign of a Time Zombie. 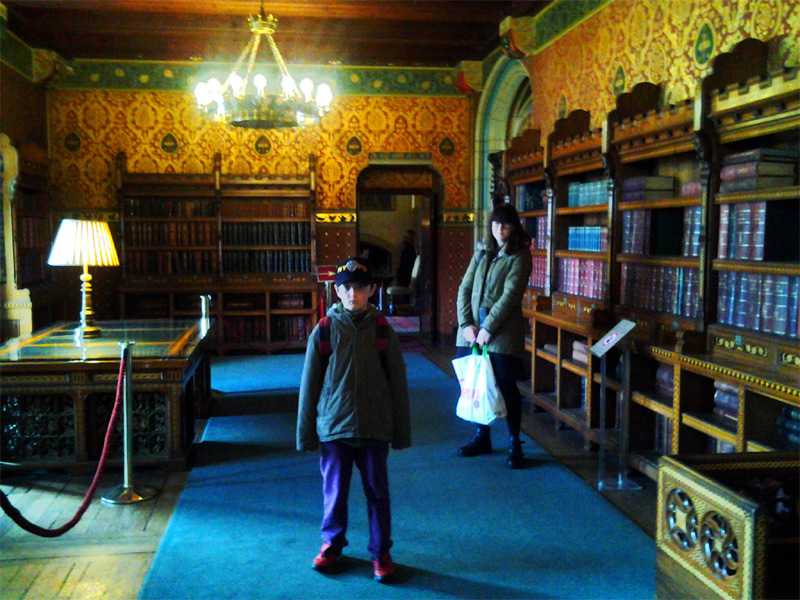 It was a very quiet and safe place full of beautiful old books. Unfortunately I couldn’t see the Encyclopedia Gallifreya! 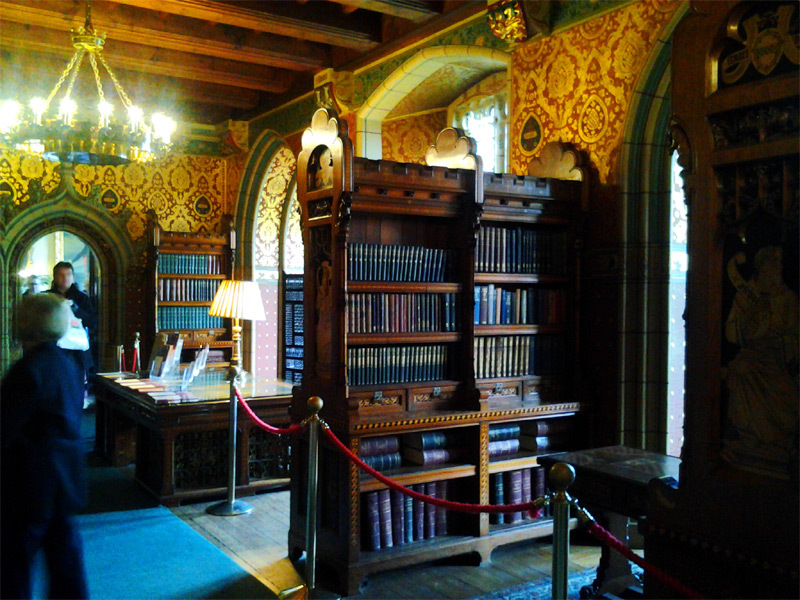 The library is very grand and the bookcases are decorated with animals of all sorts. There was daylight coming through the window, unlike when Clara was there, and the ceiling was not infinite – good ol’ computer graphics! You can get married at the Castle and have your reception in the library – how cool would it be to have your wedding in a room of the TARDIS????? 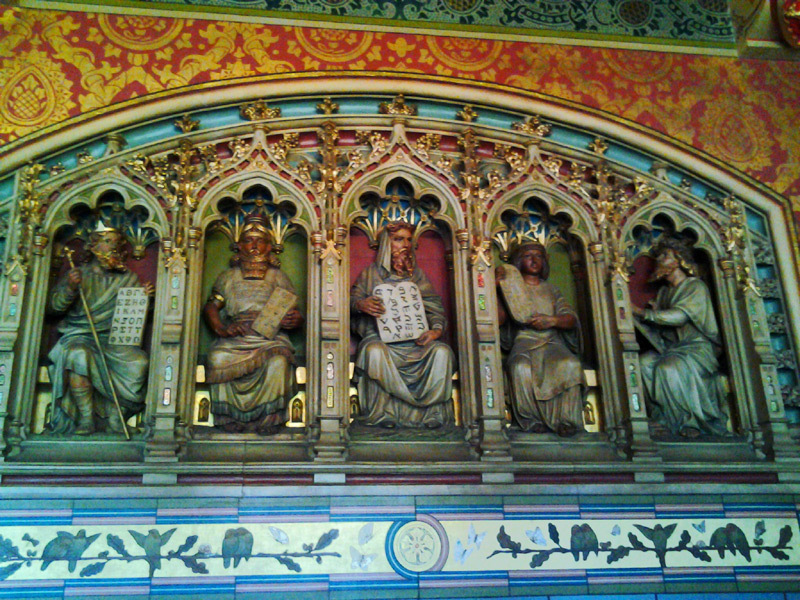 I will tell you about other locations within Cardiff Castle soon in another post. In other news – this Friday I found a copy of the 285th issue of Doctor Who Adventures magazine- complete with Amazing Doctor Dress Up Set. Dress Up Sets are cool! 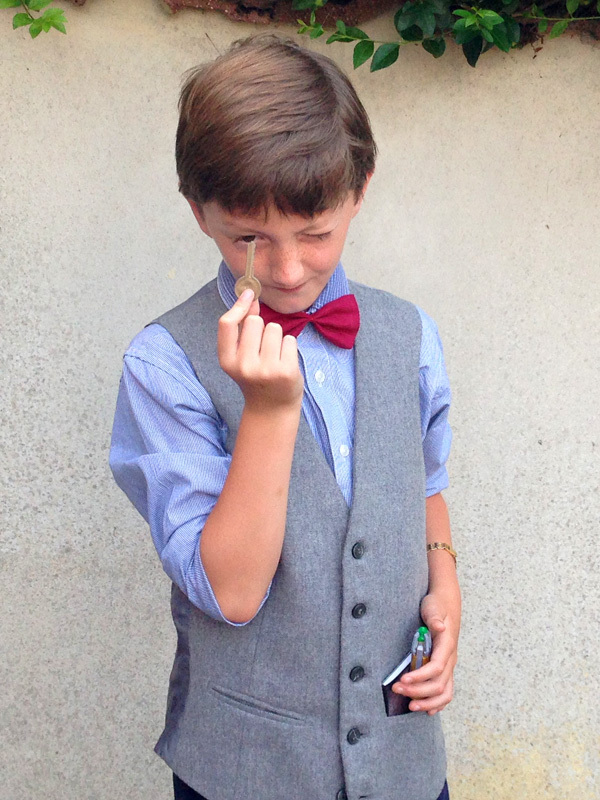 The set contained a TARDIS key, sonic screwdriver, bow tie and psychic paper. I was inspired and used them to dress up as a different Doctor ( I think you already know which one it is!) . I copied the outfit the Doctor wore for Journey to the Centre of the TARDIS but I wish I had put a Big Friendly Button mark on my hand – maybe next time. I hope you like the pictures! Until next time, Da boch chi!